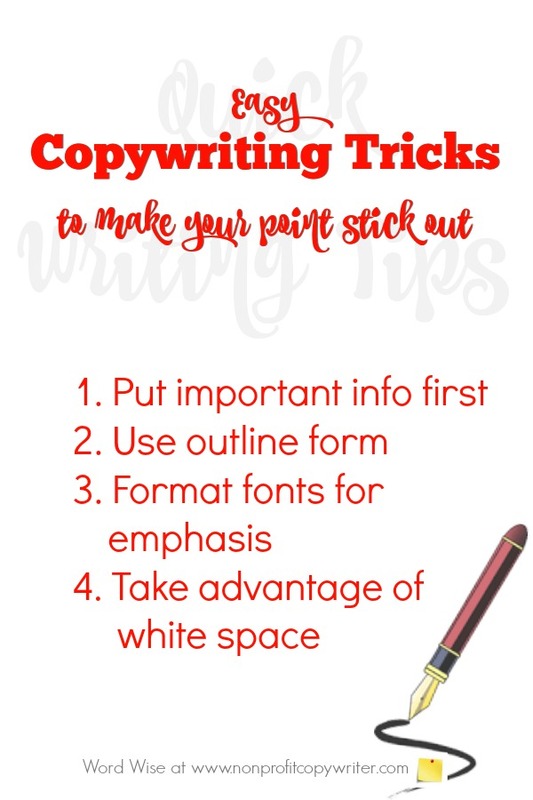 Writers know a handful of basic construction tools - copywriting tricks - that ANYONE can learn to use to help a point stick out. Naturally, your point must contain be a compelling benefit (like finding a good deal, helping a child in need, or inspiring confidence in writing skills). … simple techniques anyone can master to help underscore your point. These practical, constructive tools help make your point obvious to the reader. So obvious that it’s hard to miss. You can use them in copywriting or when you write content to drive home your main idea. Put the most important information first. Follow it with next most important and so on. This “inverted pyramid” format, widely embraced by journalists, gives your reader the good stuff right out the gate. Content order emphasizes your point by virtue of rank. Avoid the tendency to build up to your argument and leave the fireworks until the end – your piece is not a novel, and readers won’t wade through character and plot development to get to your point. Grab them right away instead. Use outline form. Subheads and lists make your most important point or set of points stand out. Readers like to scan to get the gist of what you’re saying .If you get their attention, they’re more likely to read the fine print for details. Format fonts for emphasis. Italics, bold, underlining and CAPS draw the eye in and reinforce your point. or even skipping a line or two! Let’s see how I did with making my point with copywriting tricks (which by now you know is that anyone can acquire basic writing techniques to emphasize a point in copy). Go back to the top. Identify at least 10 examples of these simple copywriting tricks. See – it’s easy, isn’t it?